Los Angeles Signs | Create Sign Banners that get your ATTENTION! HOW TO CREATE SIGN BANNERS that catch your ATTENTION! Here are some statistics about basic color combinations, font styles, margins and graphics usage in successful banners. Since the primary goal of a banner is to grab the viewer's attention and then communicate a message, the banner should be readable and visually attractive. The following steps are a good place to start to create an appealing and attractive banner, and to maximize its effectiveness. 1. Choose appropriate font styles. Avoid using more than two type styles on a banner. The more fonts used, the harder it is to read. Sans serif fonts like Helvetica, Futura and Antique Olive are the easiest to view from a distance. They should be used for the primary message on your banner. Likewise, serif fonts such as Goudy, Benguiat or Times are appropriate for a secondary message. Fonts such as Old English Text or Engraved are almost impossible to read correctly from a distance and should only be used when the viewer is stationary for a period of time (such as in a conference hall, meeting room or retail store) to be able to absorb the entire message at their own pace. Take into account the type of business or event where the banner will be used. A bridal shop or beauty salon banner can be dressed up with a script font such as Brush or Commercial Script; however, these fonts would be out of place in an auto parts business. Also, try to stay away from using all upper case lettering on your banner. It can be used for one word or a line of text for emphasis, however, it takes the human eye longer to read and process words in upper case. Logos, clip art, borders, etc. can effectively be used to grab the viewer's attention, but should not overpower the sign's main message. If the viewer is only concentrating on the cool clip art or graphic, the message has been lost. As a signage professional, we have already developed an eye for what works and what doesn't so if you need our help or have any questions, please give us a call. As you drive around your community, look around at all the banners grabbing for your attention. Notice the ones that stand out. Mentally take a note about one or two elements of the banner design that grabbed your attention in the first place. 3. Consider viewing distance and viewing time. "How far away will the banner be from the viewer?" If a grand opening banner will be on the front of a business with a large parking lot between the storefront and the street, the letter height must be large enough to be viewed by drivers on the street. Also, keep in mind that a driver only has about 1.5 - 3 seconds to read a message while in motion. 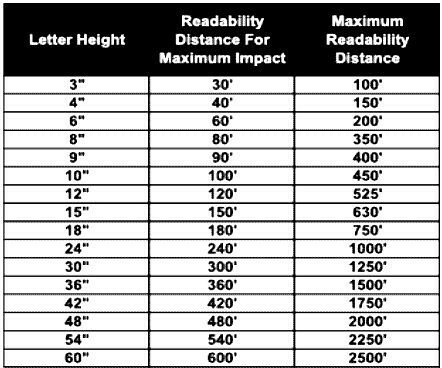 The chart below will help determine the correct height vs. viewing distance. 4. Use effective color combinations. 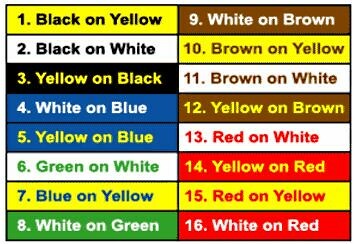 The following chart shows the most readable and successful color combinations in order of viewing effectiveness. Color combinations with high contrast between the background and letters are easier to read and can be viewed from greater distances. Always consider the type of business or event when choosing colors. Pink, purple, teal and orange colors aren't shown on this chart, but still can be used for certain holidays, special events or parties. 5. Banners need margins and white space. Margin widths are usually the most abused spaces on a banner. Common errors include stretching letters and graphics to fill the entire banner to the edges, or the text and graphic is too small for the sign and the margins are too big. A general rule of thumb is to have the top and bottom margin be 10% of the height, and right and left margins be at least as wide as one of the banner's main font character width. For example, a 48" sign should have a 4.8" top and bottom margin. A three-foot wide banner should have at least a 3" margin on the top and bottom. Avoid filling the empty spaces of the banner with graphics. White space helps keep the viewer's eyes concentrated on the text. Although these are good general guidelines, they might not always produce desired visual results. Use your own discretion and intuition. Creating attractive and effective signage is essential. If you have any further questions or need The Sign Studio to design your banner or signage, please give us a call at (818) 843-9200 or send us an e-mail at info@signstudiola.com.